Once in a while, my neighborhood Japanese supermarket hosts a rice festival, and I treat the family to a sack of glorious Japanese-grown rice. Because the short grains are slightly sticky but still retaining a little bite and bounce, it's great for absorbing saucy dishes. I made Gyudon, or Japanese Beef on Rice as a topping, and Saucy Eggplant as a side dish. The Gyudon recipe is adapted from a favorite cookbook called Harumi's Japanese Cooking, and the Eggplant dish is from an old Chinese cookbook that I pinched from my Mom's collection. Now this is my idea of comfort food! Pour the wine and water into a saucepan and boil over medium heat. Once it has boiled, lower the heat and add your beef one slice at a time and simmer for about a minute. Skim the surface of the broth for any residue. Add soy sauce, mirin and sugar. Prepare a piece of aluminum foil in the diameter of the saucepan and let it sit directly on top of the beef mixture. This "drop lid" technique concentrates the flavor of your broth. Simmer for about 5 minutes. Remove the lid, add the onions and mushrooms, and continue to simmer until soft. Scoop the freshly cooked rice into your bowl. Spoon the beef, onions and broth onto the rice bowl. Garnish with sesame seeds and spring onions. Serve with japanese pickles, if available. Peel the eggplant. Cut off both ends and cut the remaining section into 3-inch lengths. Halve lengthwise. Heat pan and add oil. Deep fry the eggplant pieces in batches for about 2 minutes. Remove and drain. Leave about 2 tablespoons of oil in the pan. Stir fry garlic until fragrant, then add the eggplant, soy sauce, sugar, salt, vinegar and water. Cook over medium-low heat for about 3 minutes, or until the liquid is nearly evaporated. Garnish with spring onions. Serve immediately. I have not had many successes in baking, I can probably count the few triumphs on my one hand. I've always loved that wonderful, homey smell of fresh bread baking in the oven, but I never thought I would enjoy that in my own kitchen...until a dear friend (thanks P) showed me how homemade bread can be as simple as apple crumble (the ONE thing I can bake!). This is her recipe. The dough should be prepared the night before baking. Pour the sachet of yeast into 1/4 cup lukewarm water, add the sugar and mix well until dissolved. Set aside while you prepare the dough. If active, the yeast will rise. In a large mixing bowl, add the all-purpose and whole wheat flours, salt, oats, and seeds, and mix well. Pour in 500 ml water and the risen yeast mixture, and mix well in the bowl. The dough should resemble wet porridge (if too dry, add a bit more water to get the right consistency). Leave in the mixing bowl and cover tightly. Leave overnight in the fridge. The next morning, preheat your oven to 275 deg C.
Use a large soup spoon to scoop out the dough, and form into buns with floured hands. 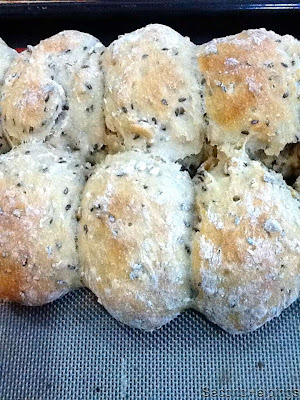 Lay them side by side on a baking tray lined with a silpat mat or baking paper. Bake for 5 minutes to brown, then lower the heat to 220 deg C, and bake for another 20 minutes, or until an inserted toothpick comes out clean. Let cool before separating into individual buns. Store in an airtight container. I sat, staring at my screen for the longest time, and usually the words would flow from my thoughts to my fingers, tapping away at the keyboard. But I just stared. All of a sudden I was unsure of what I should say, or if I wanted to say anything, whether it was important at all. Day after day, I kept drawing a blank, until I finally just turned off completely, and took a break. Although the cooking still continued, I had a bad case of writer's block. It's been a month or so. I started to miss my blogging world - the photos, the recipes, the comments, my friends, and yes, even the writing. Sorry to have disappeared for a bit, but I'm back. Here's a very hearty recipe for Slow-Roasted Pork Belly, adapted from the traditional Danish technique and a more modern Jamie Oliver. Preheat the oven to 220 deg C. In the meantime, with a small sharp knife, score the skin, through the fat, but be careful not to cut into the meat (or ask your butcher to do this for you). Place pork belly skin side down into a roasting tray and pour enough water just to cover the layer of skin and fat. Bake for 30 minutes. Remove the baking tray from the oven, and reduce the heat to 180 deg C. Pour out the water from the baking tray and set aside. This can be used for making gravy if desired. Turn over the pork belly so it is skin side up. Rub salt onto the skin and into the grooves. Add the apples, shallots, and rosemary underneath the pork, making a flavorful nest. Roast for another 2 hours. At this point, the skin would have started to puff up into a crackling. If not, turn up the oven to broil, carefully watching the pork as the skin starts to puff up, making sure it does not burn. Remove from the oven and let the meat rest for about 10-15 minutes before slicing. 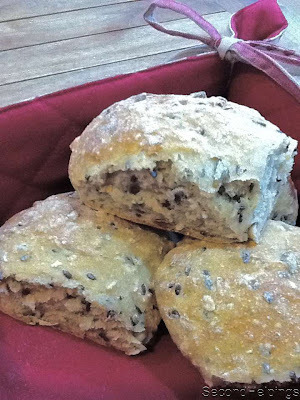 Serve with pickled red cabbage and a good strong mustard. You can also make a brown gravy from the drippings, and serve with potatoes. Thanks to Lala of Kulinarya Cooking Club, who came up with another challenging theme of Decadent Food. My dish for April is Calamansi Lime Pie, made creamy by the surprise ingredient, condensed milk. The sweet, tart and creamy combination makes you crave for another slice. The recipe is adapted from Jeanne Kelley's wonderful cookbook, Blue Eggs and Yellow Tomatoes. Mix together the condensed milk, lime juice, and zest until well blended. In a separate bowl, whisk the eggs and pour into the condensed milk mixture, mixing thoroughly. Pour into the prepared pie crust and bake until filling is set, about 20 minutes. Remove from oven and let cool completely. Chill in the refrigerator while making the compote. Place blueberries and sugar in a saucepan and let simmer over medium heat for about 15 minutes. The mixture will thicken and reduce. Set aside to cool. Spoon over the pie slices and serve with whipped cream or creme fraiche, if desired. 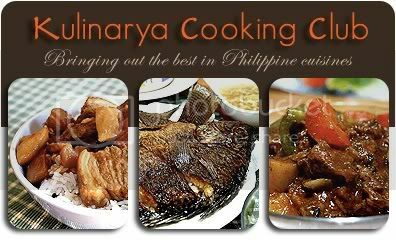 If you’re interested in joining our Kulinarya Cooking Club, please feel free to drop by our foodblogs and leave a comment. We would love to hear from you! Do you find yourself driving the usual route - to the kids' school, to work, to the supermarket - only to realize that you're already there? But wasn't it just a few minutes ago that you got on the highway, cranked up the radio and started the journey? And just like that, I realized too that I've now been blogging for a year! What started off as a challenge after taking a writer's workshop, and inspired by a retreat in Bali, my blog now has 72 entries. I've met many like-minded, food-crazy friends and even felt an instant kinship with some of you over our posts. I've travelled around the world vicariously through your blogs, savoring the aromas and tastes that your recipes brought to my kitchen. So thank you, bloggers, for sharing your world with me, as I've enjoyed sharing mine with you. And thank you, readers, for stopping by to visit. See you again soon.